The table is based on schedule 40 steel pipe and can be used for a low pressure services lines with pressure head 6 inH2O and gas with 0.6 specific gravity and pressure drop 0.3 inH2O. Engineering ToolBox, (2003). 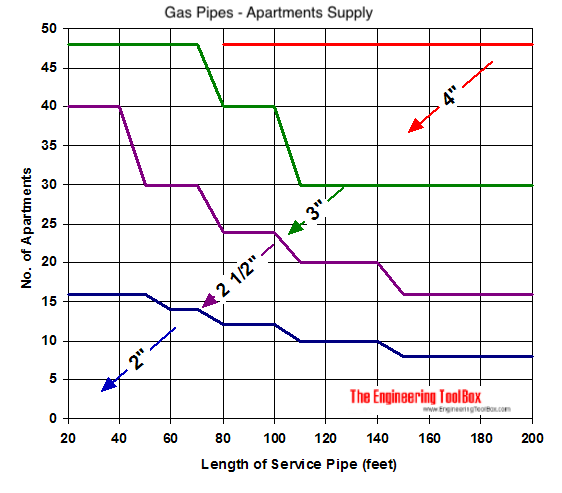 Low Pressure Gas Pipe Sizing. [online] Available at: https://www.engineeringtoolbox.com/low-pressure-gas-piping-d_481.html [Accessed Day Mo. Year].